Talking to Dennis Frederiksen at Fraser Yachts this morning, I learn more about his new joint central agency for sale, with Bruce Brakenhoff at Perini Navi USA, the 43.4m sailing yacht Ohana. 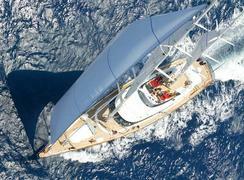 Ohana was built by Perini Navi in 2004 to a design by Ron Holland. ABS classed and MCA compliant, this all-aluminium superyacht accommodates 10 guests in a master suite plus two double and two triple staterooms. Twin 598hp Deutz engines give *Ohana *a range of 4,000 nautical miles at 10 knots and she is on the market asking €17.9 million.